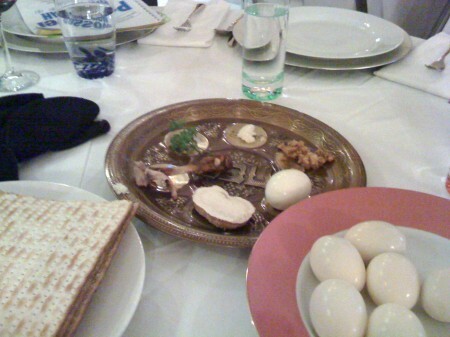 Wednesday and Thursday, I went to two very different, but fun Passover Seders. The first one was at my aunt and uncle’s house. There were about 50 people there, and they always use a custom-made haggadah written by a friend, which has lots of funny asides. There were lots of young kids there, who did most of the reading, though I did take my turn, too. Suzie and Danny were in town, and Michelle got back the next day, in time for the Thursday-night seder at my parents’ house. 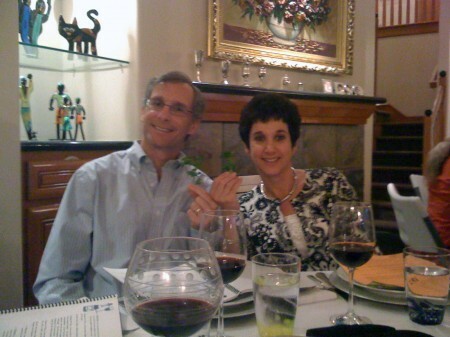 It was a much smaller affair, of just 8 people, but that’s still more than enough to have a successful seder. We had some new family friends over with their two young children, who were absolutely adorable, and they sang songs for us and had a blast running back and forth from the door, opening it for Elijah and checking out his cup to see the wine level was any lower. My mom made her fantastic matzo ball soup, haroset and matzo farfel along with asparagus, latkes and other passover dishes. She also baked two cakes, and our friends brought over matzo candy — a delicious combo of matzo, chocolate, caramel and almonds. Yum! 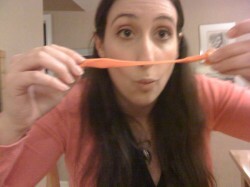 We also played with Silly Putty, which was one of the Afikomen prizes for the kids. It was much more fun than just giving out cash and worked well since we were a small group. We took a bunch of funny photos, and I managed to get orange Silly Putty all over my iPhone case. That stuff sure sticks! I think I’ve finally scraped it all off. Thanks, Mom, and everyone else who had a part in cooking all that food, setting all those tables and bringing everyone together. Check out some more of my Passover photos on Facebook.